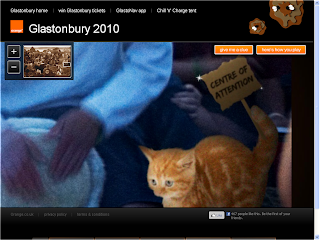 Digital Examples: Win free Glastonbury tickets with Orange's Where's My Welly? Win free Glastonbury tickets with Orange's Where's My Welly? This is a fun competition, organised by Orange as part of their Glastonbury sponsorship. 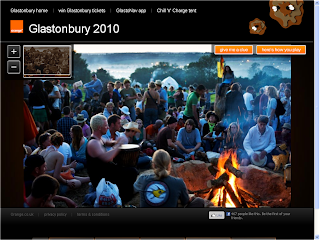 The event is long sold out, but you can win tickets every day until 9th June by spotting an Orange Welly in some pictures from old events. 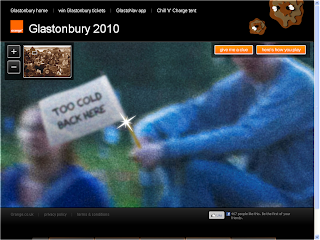 The site uses Silverlight (I think), which allows you to zoom into the photo with amazing clarity. Every day there's a new picture, with a clue, and other clues hidden in banners in the picture - see the examples below. Great idea; and excellent use of the technology. If you go to the Orange site you can also find a mobile app, and the usual Chill and Charge tent. That's a nice idea with a well-thought-out and simple implementation. It's actually created in Flash not Sliverlight, you can find this out by right clicking on it. I can't tell my Flash from my Silverlight, clearly.